The CCBS Annual Retreat will be held at the Sheraton Universal Hotel in Universal City from Friday, March 29 through Sunday, March 31, 2019. 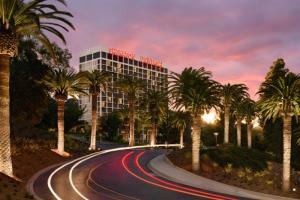 This will be our fourth visit to the Sheraton Universal, adjacent to Universal Studios and Universal CityWalk. One of the most popular venues for all attendees, please mark your calendars NOW and plan to attend. We look forward to an exciting weekend of systems biology discussions and forging new collaborations. Registration is OPEN and schedule information will be available soon. For additional information, please contact Karen Martin, kymartin@uci.edu. The 2018 CCBS Annual Retreat will be held at the Omni Hotel in downtown Los Angeles from Friday, March 23rd through Sunday, March 25th, 2018. The Omni hotel, adjacent to the Museum of Contemporary Art in the Bunker Hill area. We look forward to an exciting weekend of systems biology discussions and forging new collaborations. Friday, March 31st through Sunday, April 2, 2017. Registration fees: $350. All meals and two nights lodging are provided by CCBS. Attendees provide their own transportation. Guidelines for poster presenters: Poster abstract: Please provide a brief summary (250 words or less) of the content to be presented. List 3-6 keywords. Font type – Arial, size - 11 pt, text box size – 7 3/8" (19cm) x 4 ½" (11.5cm) (one half of an 8 ½ x 11 page) in Word format (.doc). List the authors with the presenting author indicated by an asterisk (*) next to their name; separate each author by a comma. Easels and poster boards - 4' X 4' - are provided. UC Irvine, Student Center (Crystal Cove Ballroom). The conference brings together diverse researchers from leading Southern California academic campuses to showcase current research activities and promote collaborative opportunities in all areas of Systems Biology. Program: 16-18 speakers + grad/postdoc poster sessions.